The use of agent-based modelling approaches in agricultural systems analysis has been progressively increasing over the last few years. Agent-based models (ABM) can be seen as a critical tool for the understanding of farmer’s behaviour in response to changing environmental, economic, or institutional conditions. One of the key advantages is that ABM allow interpretation of agent-specific behaviour covering the heterogeneity of individual preferences or motivations often going beyond income maximisation. Despite this potential advantage, many agricultural ABM either rely on income maximisation or focus on a few, elementary rules that have to strongly abstract from real world decisions. We here present a model that combines a simulation framework that captures important principles from behavioural social sciences with standard bio-economic farm level modelling. Our approach provides a generic and theoretically sound approach to improve the diversity in representation of farmers’ decision-making and the integration of social interactions in ABM and farm level models. This presents an opportunity to align the simulation of farmer’s decisions more closely to actual decisions and thus support the development of reliable explanatory models of agricultural systems. The telecoupling framework provides a systematical approach of examining interactions between the human system and the natural system over distance. It not only highlights the interactions between the focal regions (i.e. the sending system and the receiving system), but also the influence on the related regions (i.e. spillover systems). An important channel that telecoupling interactions worldwide take place is through international trade. The recently developed method can decompose the gross export (i.e. the export recorded when a product crosses a national border) into values provided and absorbed by all countries involved in the global value chain (GVC). 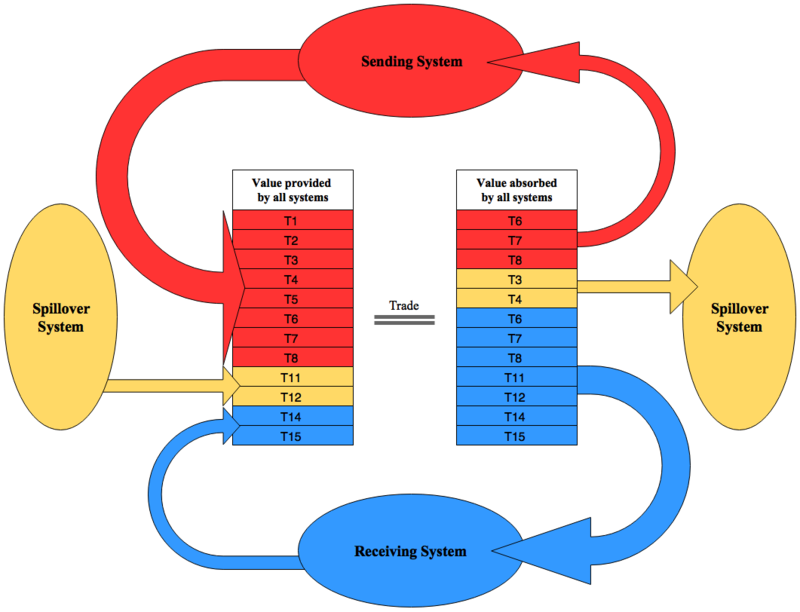 Viewing trade from the lens of the telecoupling framework, this method allows for the quantification of in- and outflows between the sending system and the receiving system, and in- and outflows of the spillover system in any recorded trade. It is important to note that the same method can be applied to analyse the flows of environmental assets (e.g. carbon, water, land) embedded in the trade of values. Given multiregional input-output databases have been well developed, combining the decomposition method of GVC and the telecoupling framework allows to examine the socio-economic and environmental interactions between at any sector in any country driven by trade. In this study, we apply this approach in understanding such interactions between Europe and Latin America through the trade of biomass products in the period 1995-2009. As a conceptual framework for understanding contemporary sustainability challenges, telecoupling emphasises the importance of socio-economic and environmental interactions over long distances. These long-distance interactions can occur through multiple human activities. Here we focus on international trade, a major channel of telecoupling flows, and in particular on the international trade of metals. We use the data of physical products and embedded greenhouse gas (GHG) emissions trade in the World Input-Output Database (WIOD) to quantitatively examine how countries contribute to both economic and environmental flows through trade of metals, but also how that contribution varies depending on their position in the global value chain (GVC) of contemporary international trade. This analysis is built on previously developed techniques for decomposing gross exports of products which we apply to examine embedded GHG emissions. We make comparisons between countries' contributions to flows of economic value versus embedded GHG emissions, but also examine contributions beyond total volumes of trade and bilateral trade. Specifically, we quantify the economic and environmental ‘spillover’ effects that occur in contemporary international trade due to the GVC in which flows of intermediate goods form components in other subsequently traded goods. We interpret differences between countries' contributions to the flows of economic value versus embedded GHG emissions as being related to the intensity and efficiency of resource use during production. In turn, differences in contributions to direct trade flows versus spillover flows are related to their positions in the GVC. Subsequently, we discuss other elements of the telecoupling framework in trade – agents, causes and effects. Quantitatively incorporating these telecoupling framework elements alongside spillover flows will enable investigation of dynamics and relationships that traditional trade theories, data and models do not currently account for well. This study proposes an agent-based simulation model to explore the dynamics of defection from North Korea. Methodologically, the challenge lies in the small proportion of the actual population that defects. Defection is a contagious process, whereby successful defections encourage further defections, but nevertheless remains at an extremely low rate. To model a realistic proportion of defection, the implementation of the simulation will have to allow for a large number of agents, whose behavior will have to be simulated. We model the entire North Korean population based on demographic and economic characteristics, as well as national economic dynamics. We investigate the direct and indirect impacts of the famine that occurred in the mid-1990s nationwide as a systematic shock, which substantially changed the landscape of defection from the country in its aftermath. Simulations are run for a large number of replications to evaluate the robustness and consistency of the simulation findings and are calibrated to the empirical record of defection from North Korea from 1992 to 2014. The simulation results suggest that the North Korean regime has been reducing its repression levels over time, but also that originally individual North Koreans were relatively optimistic about their chances of success and that based on observed defection attempts, they have updated their expectations to more accurately reflect the actual levels of repression. It suggests that citizens are aware of about half the attempts at defection – the remainder goes unnoticed – and that they base their assessment on defection attempts over the previous seven or so years.